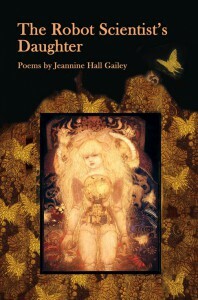 Mayapple Press is very pleased to note that The Robot Scientist’s Daughter by Jeannine Hall Gailey has been named as a candidate for the Science Fiction Poetry Association’s 2016 Elgin Award. Members of the Association will vote on the candidates. Nominations will be open until May 15th. The full listing of the candidates can be found here. Jeannine is in fine company. Or perhaps it’s the other way around, they are in fine company with her! We wish Jeannine good luck with the ballot. The Robot Scientist’s Daughter is a remarkable work and one deserving of wide recognition.